Heartwood employs certified and highly trained arborists who will put their extensive knowledge of trees to use for you. We provide tree care service in Cecil County and Harford County Maryland, Delaware, and southern Pennsylvania. We understand that trees are a valuable investment that add so much natural beauty and character to your property. Trees require care to look their best and stay healthy. That’s why at Heartwood Landscape and Tree Service, we specialize in tree health care. Our experts can evaluate your trees to determine the best course of action in terms of pruning, cabling, disease management and lightning protection. If you have a waterfront property, Heartwood can provide expert advice on how to improve the view through selective pruning and thinning of limbs that conserves trees and meets Chesapeake Bay watershed requirements. Also, Heartwood’s tree experts can provide storm damage assessment and hazardous tree assessment. When trees are too diseased or damaged, they can pose a danger. 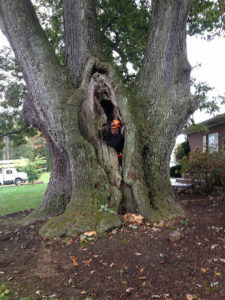 Heartwood Landscaping’s licensed tree experts are skilled in carefully removing problem trees in any situation. • We use proven safety standards and equipment, including cranes, to remove problem limbs or entire trees. • Stump removal that includes grinding the tree trunks and roots, then removing all debris. Please contact us at manager@heartwoodlandscape.net and we will gladly answer any questions you have concerning your trees. Copyright © 2019 Heartwood Landscaping. All Rights Reserved.